There is a haunting sense of longing in Amanda Selwyn’s newest creation Detour. There is longing for connection, a sense of journeying and a sense of trying to choose which path to take amidst an environment that is constantly shifting in both its perspective and perception. 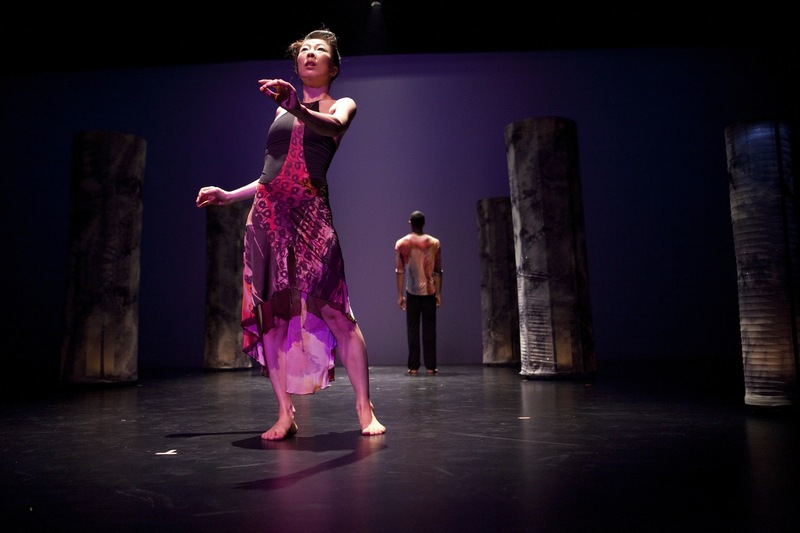 Detour is an evening-length work for the entire company and is set in three sections, Illusion, Sojourn and Glimpses. Each section has four to five subsections, each with it’s on title such as Windblown, Reflect and Reverb. The differentiation of each subsection is made by the transitioning of light sculptures/columns that varied in size, as well as different projections upon the back wall. The sections and subsections flowed seamlessly from one into the other. The first was Rooftop; Alexander Dones stands alone on the stage, arms by his sides, he looks out into the audience, seeming so venerable. He starts to move one arm and follows thru with his torso, thus beginning a solo that was an expression of strength and fully tapped his amazing capabilities. Mr. Dones was able to blend his body with the music, shifting his gravity and focus with movements that were lyrical yet not soft. In Shadows, six dancers dissolve into a duet for Jenny Gillian and Justin Lynch; they begin to tentatively explore the other with a slight touch in which the other responds. Ms. Belous reaches for Mr. Lynch, they fall together then step apart and this develops into a dance of shared moments of intimacy. 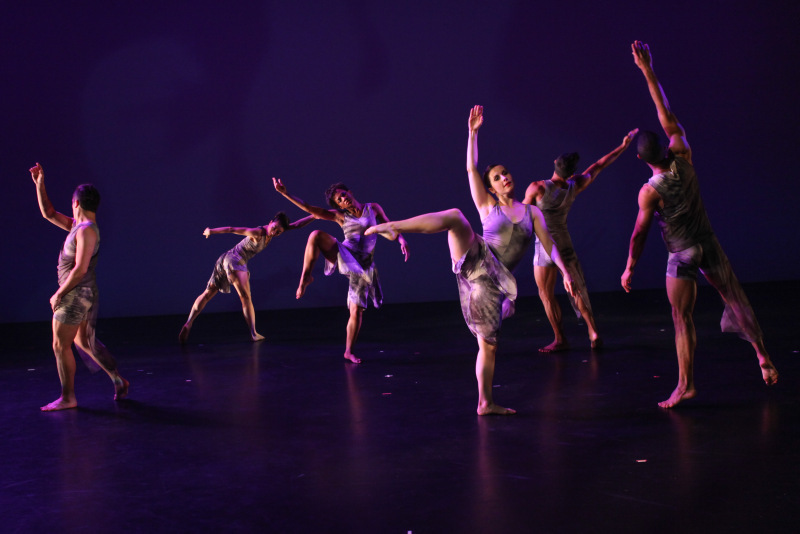 Four women enter the stage and the couple departs while the four move in unison, wide-reaching arcs of the arms flow into smooth, breath-filled movements. Another woman joins the four to become five, they leap while turning their bodies then falling to the floor only to immediately stand and turn again, always the wide sweeping arcs of the arms, a fluid movement that flows from one moment to the next, unbroken at any point. In Reflect, Catherine Coury and Robert Vall performed a duet of tender passion. Mr. Vall reaches for Ms. Coury as she arches back, he grabs her gently behind the neck to ensure she does not fall. He seems protective, she moves away only to return, he gentle accepts her into his arms moving with her as if she is something fragile and precious. Patiently they reach, entwine, part, till they establish communication in a voice of sameness, a language that only they are able to respond. Again the dancers reach for each other, a slight touch leads to movements that separates them and then draws them back together again. Within the sections with more dancers the movements seem hesitant at times, yearning, trying to connect with another which is sometimes successful and sometimes not. The dance builds with the music, expectant and alive. When the whole company is on stage one person separates, leaves, then returns only to have another dancer repeat those same actions. Ms. Selwyn’s dance vocabulary fully explores movements of the torso allowing the rest of the body to respond, experimenting with following or resisting the torso’s momentum. 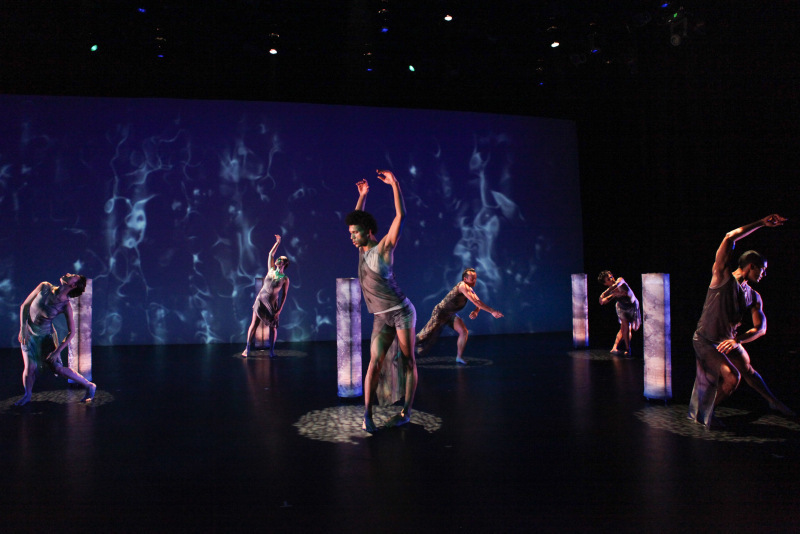 In Stop, Look, Listen, projections on the back wall mirror the movements of the dancers, when one dancer extends an arm, a mirrored image, larger than the dancer by several times extends the arm in the same movement. Sometimes the image is so large that just the torso or parts of a body can be seen. With the projected images on the wall you begin to wonder what is real, is the projected images actual reality or is the dance. If the projected images are the actual reality that would make the dance, and the dancers, nothing more than images created by the synaptic response from someone else’s thought processes as seen in a dream. Detour is not so much vignettes but rather individual conversations that sometimes overlap. Sometimes it is one person, sometimes just two and then several, but each section is speaking with the same vocabulary of movement and purpose. 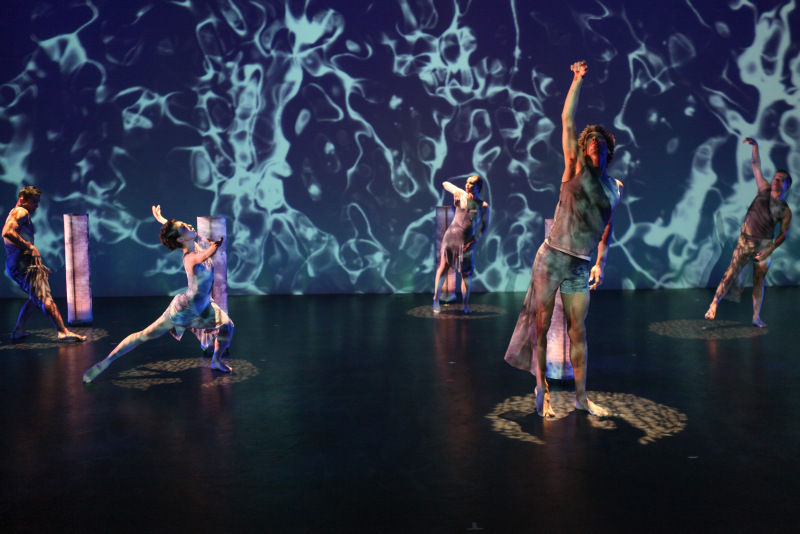 At times there is a sense of weaving underwater, enhanced by the lighting and back wall projections, the dance is filled with movement like that of a remembered river’s current or a mellow wave. Joori Jung was wonderful, your eye flowing her every time she is one the stage. She has a natural lyricism that is well matched with Ms. Selwyn’s choreography. Alexander Dones is one of my favorite male dancers, his athleticism is commanding to the eye and his natural abilities create exciting movements that flow from tender to explosive. Robert Vall possesses strength to his dancing that is accentuated by a long, lean line; he is a joy to watch. Mackenzie Tyler moves with intensity and a feminine sense of power, you feel her joy of dance in every step she takes. Justin Lynch has a fluidity that is rare and he does not move but flows into every movement or shape he takes. He is delicious to the eye. Francisco Silvino, his body sculpted like a Greek god, possesses a calm dignity of presence on stage, his movements masterful and strong. Ms. Selwyn has her own voice, she speaks from a place within the heart, she is unafraid to peer into the corners of one’s soul. She explores every corner, and what she finds she expresses with movement that which cannot be said in words. 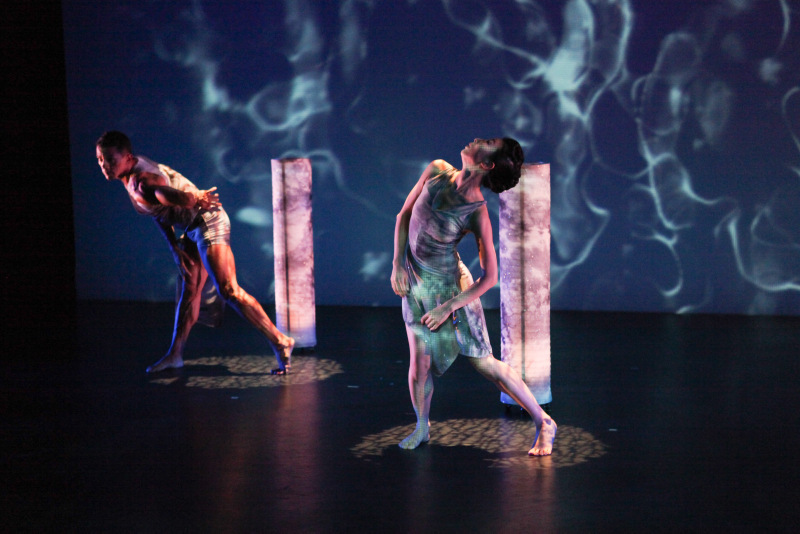 Detour explores the concept of perception, of how we perceive or interpret what is before us. It creates a world where surrealism is the norm, a world where perceptions shift constantly, but it is a world that is intriguing and you want to see more.